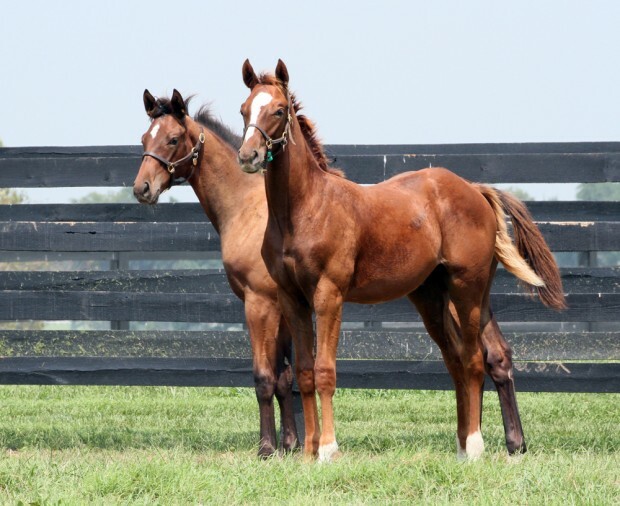 Thank you for these wonderful photographs of Zenyatta’s youngest colt. I like to think he got his chestnut color from his ancestor, Secretariat. The photographs are sensational. Abys is a very talented photographer especially of horses. He/she has a very promising career ahead. The scenery and background plus horses could not be better. Shows a great artist at work! Looks as if all went well with the weaning. Congratulations! Haven’t seen better photos in this kind of environment and family situations. Thank you for posting. I think weaning is fascinating. I wish I could see it just once! Weaning is really stressful to the mare and the foal the way that 99.9% of farms do it. It is not a nice thing to watch mares and foals spend a couple of days whinnying and whinnying. My goodnesws, our 13Z is so grown up! Thanks for sharing the photos and letting us know our Queen is well and enjoying the company of Life is Sweet again. Boy, the stories they could share of times on the track would be amazing. The subject of weaning for 13Z came up on the Forum earlier today too. Lo and behold, it’s happened! And again, everyone has survived, and looking great! Our boy is looking super; beginning to have a more adult look to his face. He continues to impress! Just a beautiful guy…those shoulders; that rear; that full look to his body (lots of heart and lung room). Thanks for sharing all the info and pictures with us. Thank you, Alys, for the wonderful photos! Everyone looks amazing, and 13Z is always looking for the camera, isn’t he! Sending Zenyatta lots of hugs and kisses from Ohio. Time passes so quickly. How big Little Red is and did you notice he was always aware of the camera. He is an impressive looking fellow. So glad that Zenny and Life is Sweet are together again. Now they can be bff’s not competitors. ahhh. . .such beautiful pictures, momma Z and Z13 doing well. It’s nice to start the day with this good news. Best of luck to Z13. I’m sure he’ll do great. He and Big Mama Z will always be bonded with the same birthday. :) Thank you for the update and photos. Good to see Zenyatta and Life Is Sweet together again! Time sure does fly! Zenny and 13Z are looking fabulous and we are so happy for Team Z! WE send love and hugs, George, Linda, and Milyone. Wonderful to see long time friends, Zenyatta and Life Is Sweet, together again. We will never forget visiting them in adjacent stalls in Barn 55. And particularly touching post-weaning. Always a difficult time at the farm for both horses and humans. Kennedys-Hope to see you at SA. Looking forward to it, Terry. What wonderful pictures! 13Z looks fantastic and so glad Zenyatta and her bff Life Is Sweet are back together! What a tender/ bittersweet moment for Zenyatta and the other Mom’s and their babies. I actually was thinking about it last night, that time is nearing for their separation. Obviously it went well and I join in all the previous posters comments about LIS and Zenyatta being together again in the paddock and enjoying life. 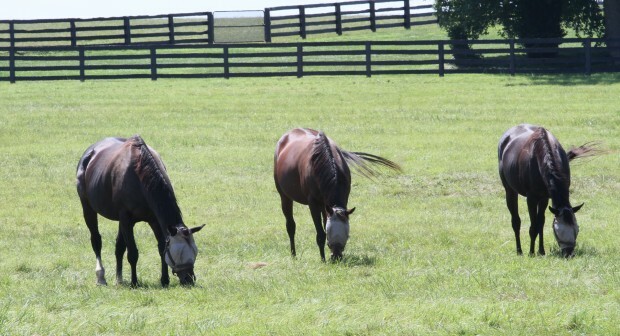 Anyone who has seen the amazing video with John attempting to cajole LIS to “wake up, it’s time to go to work” will have such memories of these two amazing althletes, enjoying their post racetrack retirement and the lovely pastures of Lane’s End. Thank you so much for the update. The weanlings look so gorgeous and the Moms the picture of health and happiness. I loved that video… she did NOT want to get up and I could totally relate. John was so sweet with her (“the track is going to close!”). I hate to think how some trainers would have handled her but I just totally fell in love with John and his gentle methods. All looking good! I must ask, whatever happened to Tasty Treat?? “Life Is Good” isn’t it when you can let the negativity in the world roll off your shoulders! May the equine gods always keep an eye out for you all, you magnificent, beautiful animals. Zenyatta, always in my heart. I so wanted him to be grey but now I couldn’t imagine him as anything other than chestnut. I’m so glad he stayed the bright red copper color. He is a flashy boy. He and 13Life is Sweet look to be built similarly but you can tell that 13Z is defiantly a boy. He just looks like a powerhouse. So glad the weaning went well. That is such a stressful time for all. I never cease to be amazed by the beauty of this colt. He is outstanding! I am curious but trying to learn, Why are the Mares wearing Mask in the paddock? What is the purpose of the mask? It is a fly mask: It is a mesh screen over their eyes and is put on over the halter to stop pesky flies from getting into the horse’s eyes. Thank You for answering me! I didnt know! I glad to see both of them doing very well! Would love to see a update on 12Z also! To keep the flies away from their eyes. Thanks for answering me! I didnt know! They are fly masks, to protect the horses’ eyes from the flies. It is my understanding that Zenny is particularly sensitive to the flies. She must be happy she has the fly mask. I was so happy to hear that Zenny was reunited with her best friend, Life Is Sweet. That’s wonderful to hear. Even though she will miss Z13, it’s great to have a close friend nearby to help her cope. @Team Z/LE–thank you so much for these photos. Every budding photographer in Z-land is jealous! We knew it was about time and that it would go well. 13 Z is such a proud looking colt, and why wouldn’t he be? His mommy is our Zenny! They will make new friendships in the weeks to come and have good times running around. I know Zenny was so glad to be reunited with LIS. Horses have great memories. They just can’t verbalize them in words. Hugs to all. Who’s the gorgeous gray with 13Z? He’s got a beautiful face! That’s Life is Sweet’s Tapit filly. Prince Red looks fabulous too. “Flyster Grants!” –high hoof, Sue! I was watching the Keeneland sales and saw a yearling colt by Tapit out of a Street Cry daughter! Chestnut with a blaze! Very handsome guy. Peace and love in the kingdom! They all look wonderful. Such beauty!!! I would so love to live at Lanes End so I could see and smell all the beautiful horses =D Thanks as always for sharing with us! Give the Queen and her Princes love for me. So glad he did well with his weaning too, but I am sure Z prepared him well. I had to laugh when I saw the 2nd photo down. 13Z looks so big and horse-ly against the fence; then you see the photo bomb of the adult horse with fly mask, and you realize he’s still a little guy. LOL! It’s always a little sad when the babies are weaned. But I’m so glad that Zenyatta is enjoying her time just grazing and hanging with friends. I’m especially happy that she is with Life Is Sweet, another one of my faves. Keep the Z, Coz, and 13Z pictures coming! Blaze is such a beautiful, smart-looking colt. I love his wonderful rump!!! Zenny is simply outstanding, isn’t she? Happy to hear that all went well with the weaning. I’m sure they miss each other, but it’s a part of life. Thank you so much for keeping us posted on Zenyatta and her boys lives. We so much appreciate it. Love to Z and the boys! The grey is Zenyatta ex-stablemate Life is Sweet’s filly by Tapit. So glad Z and Life is Sweet are back together again. Not sure who the other foal is. That foal has been with Z13 for several mths.